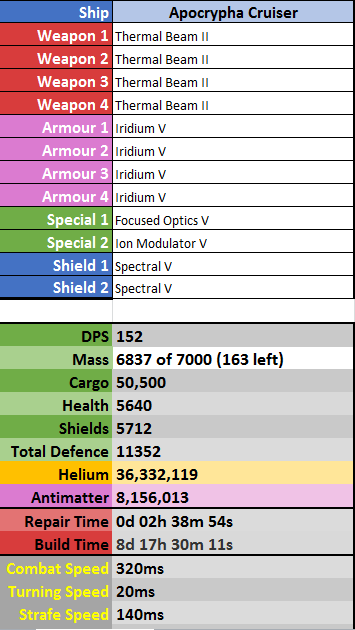 I made this ship calc a while ago for my own use and it evolved into what you see now. I recently added Komodo stats to it so I waited until now to add it in here as some of you might find it useful. If someone has this please post them here and I will update the calc. Other than that it is complete. This is awesome, thx for sharing! This is the best thing ever. THANK YOU! Amazing! Thank you so much for making this and sharing it with the community. I am going to pin this in the general discussions for you. Does it only have to be opened with Microsoft Office? I can't get it to open with Adobe. Can anything else can open it? Other wise, thanks for this! This file uses macros to dynamically adjust the template to suit the ship layout that you are calculating. 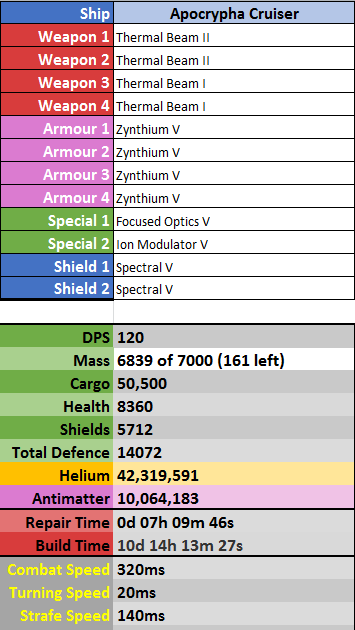 So you need to enable macros in excel, maybe that is why you are not seeing weapon slot 5, 6 and 7 Destroyer of worlds. I have just downloaded free versions off MS Excel alternatives. The only one I could find that comes close to working is Libre Office calc the rest are not working correctly with this file. 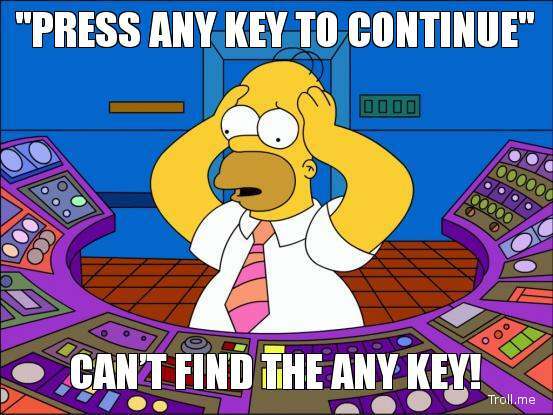 I would suggest using it on Microsoft Excel with macros enabled to get the full functionality. I'm sure there are many free versions of excel floating around the internet, or maybe a free trial of excel from Microsoft is available if you do not have it. This is egregious, man! Thanks for sharing and keep doing this kind of stuff, they're very useful. Cheers! "The road to power is paved with hypocrisy. And casualties. Never regret." I think you have a bug on that calculator. When I try to put different kinds of shields on a ship, it clears the other shield field. I don't have the refit available right now on my factory to confirm cause there's something else refitting in there, but I guess this is allowed in the game isn't it? With not much difference between builds besides the armor (zynthium vs iridium)... there is a noticeable difference in repairs. (21h44m20s difference). Vega Conflict-er since closed beta phase 1, back when torpedo harriers ruled the sector. WC- started pre-World Map, then everything went downhill. Yea, where have you been. Zynthium repair times are outrageous, especially when you use Zynth 5 this isn't a new issue players have been complaining about this forever. Nice spreadsheet you made. (No offence) But it will be a good tool to use until Phill is done with the new Fleetman. This is very cool, nicely done man. Great program. 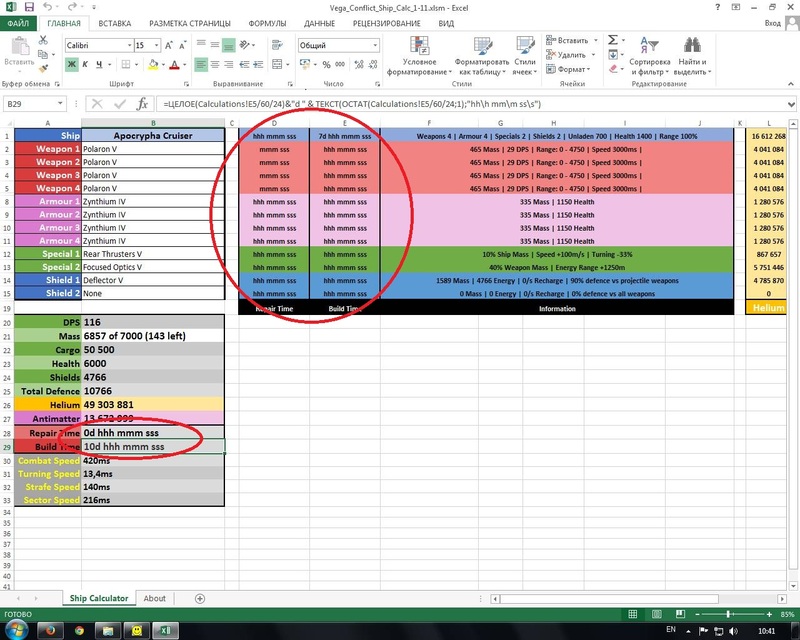 I am glad that someone is continuing the ship/fleet planner spreadsheet. I have some of the missing items. If you cant use this ship calc; Just equip Plasma Torpedo 5 and Zynth 5 on everything and play on auto. Nothing I write in the about section is going to help you. here you go. looks like if the build/rep time is less than 12 hrs it doent even show anything in the cell. I have made a test version that simplifies the formulas for the duration values. It "may" fix the display issues your having on the russian version of excel. I have also added in text values for each drop down box. So if your version of excel does not support drop down boxes then copy (ctrl + C on pc) and paste the values into the appropriate row (ctrl + v on pc).